Modern power systems are extremely large and complex physical objects to control. They, in turn, consists of large and complex components, such as bulk generation, transmission, distribution, and customer systems. These systems are interconnected and have strong interrelationships. With the significant advances of active components in distributed systems like Photovoltaics and Electric Vehicles, the customer component will also significantly impact transmission system. The U.S. electricity grid is one of the most significant technological achievements of the 20th century. This remarkable infrastructure worth over $1 trillion includes approximately 1 million megawatts of generating capacity, 200,000 miles of high voltage transmission lines and 5.5 million miles of distribution lines that deliver power to enable services essential for living. Today’s grid still largely resembles the fundamental structure of its 19th century roots, with central generating stations and electromechanical power delivery systems operated from control centers. The basic system on which our electricity supply depends hasn’t fundamentally changed, except in scale, since the early 20th Century. More than a century after it began, most electricity is still reduced by boiling water to make pressurized steam. This steam turns a turbine generator where the rotational energy of an armature in a magnetic field induces an electric current into the delivery wires. The industry then transmits this electric current from its centralized generating plats to load centers for ultimate distribution to individual customers. High Renewable Portfolio Standards (RPS) alters system dynamics in a fundamental way, especially when fewer conventional generators are on line. Solar and wind lack inertia and governor response of traditional generators. Since electricity, which flows at the speed of light, cannot be economically stored in significant quantities, the grid must continuously balance supply to demand in real-time throughout each day. A utility must always have sufficient generating capacity available to meet the maximum demand on its system. Supply and demand must balance moment to moment. A major challenge is to always have the capacity required by the consumer available while keeping in mind that the consumer’s need for electricity at any given moment may vary greatly. The U.S. electric grid is a complex network of independently owned and operated power plants and transmission lines. Aging infrastructure, combined with a rise in domestic electricity consumption, has forced experts to critically examine the status and health of the nation's electrical systems. Check out this interactive visualization map courtesy of NPR. Adequacy -The ability of the electric system to supply the electrical demand and energy requirements of customers at all times, taking into account scheduled and unscheduled outages of power lines and power plants. BES - Bulk Electric System – A term commonly applied to the portion of an electric utility system that encompasses the electrical generation resources and bulk transmission system, lines at or above a voltage of 115 kV. Dispatchability -: The ability of a given power source to increase and/or decrease output quickly on demand. The concept is distinct from intermittency; and is one of several ways grid operators match output (supply) to system demand. Generation - High-capacity (250 MVA and up) central plants connected through a transmission network and distribution system to the Customers. This may include wind farms whose total capacity exceeds this minimum threshold when treated as a single generating station for analytical purposes. 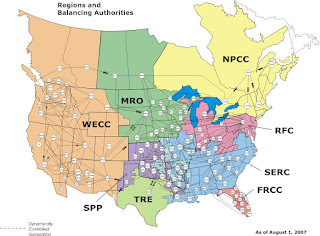 The Eastern Interconnection includes the following regional entities: Florida Reliability Coordinating Council (FRCC), Midwest Reliability Organization (MRO), Northeast Power Coordinating Council (NPCC), Reliability First Corporation (RFC), SERC Reliability Corporation (SERC), and the Southwest Power Pool (SPP). NERC - The North American Electric Reliability Council - Sets adequacy and reliability standards for utility facility owners and operators. Load Centers - Population centers, often far from supply, that need the electricity. RPS - Renewable Portfolio Standard - A regulatory policy that requires the increased production of renewable energy sources such as wind, solar, biomass, and geothermal energies. The RPS mechanism generally places an obligation on electricity supply companies to produce a specified fraction of their electricity from renewable energy sources. Smart Grid technology will be needed to help electric systems meet RPS standards. 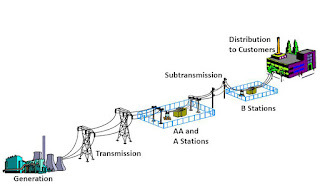 Transmission – An interconnected group of lines and associated equipment for the movement or transfer of electric energy between points of supply and points at which it is transformed for delivery to customers or is delivered to other electric systems. Variability -The extent to which a power source may exhibit undesired or uncontrolled changes in output. Transmission systems were designed decades ago to service as private toll roads delivering a one-way flow of electricity from a central utility to its end users. The designers never imagined the enormous quantities of electricity that are now being sold across state lines in competitive transactions or that lines would be used as open access freeways by wholesale power producers. Consequently transmission lines are often overloaded and blackouts have become larger and more frequent. 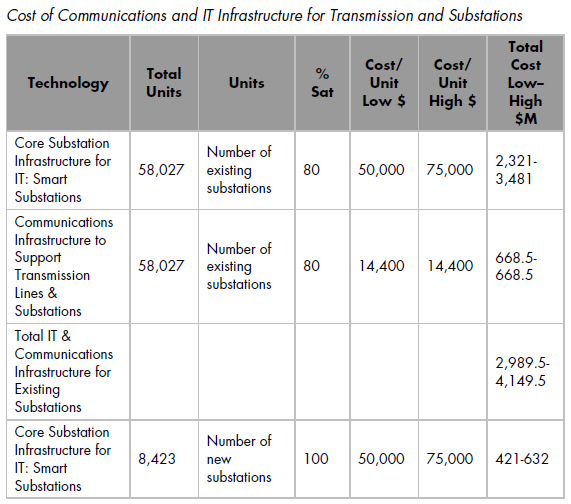 Smart Grid technology can dramatically reduce the requirement to build new transmission lines. An electronically controlled nationwide superhighway form electricity transmission will enable the inter-regional transfer of bulk power while fundamentally increasing reliability and stability. The goal of today’s politically charged debate about transmission is to determine how to use a combination of technology and policy to shore up the weak sections of the network. The physical network and the institutions that govern that network must be adapted to the many changes that have taken place in the power industry during the past decade. The physical network will require new lines or other investments to accommodate the new patterns of power flows brought on by wholesale competition. The institutions that govern transmission will also require a number of changes. Economics - Improves the cost structure of the entire industry by giving low-cost power plants access to high-cost power markets. The transmission system helps to insulate electricity consumers from the effects of natural gas price spikes, low hydroelectric years and catastrophic events. Competition - Enables competition among power plants by giving more plants access to more markets. Low-cost, imported electricity can displace high-cost electricity from nearby power plants, as has happened in recent years as new Arizona power plants have begun to serve customers in California. Renewables - Allow grid to accept more wind power. Parts of America’s existing dumb and fragmentary electricity grid are so vulnerable to load variations that their owners think they may be able to cope with no more than about 2% of intermittent wind power. Outdated Infrastructure - Most of the North American electricity system infrastructure is 40 to 50 years old and nearing the end of their useful life. Power Flow - The electric grid was built to deliver power one way from large power plants located far from energy users to users. However, today, the drive toward more renewable energy and reduced greenhouse gas emissions is leading to a rapid expansion of distributed energy, like solar and combined heat and power. These energy sources are located on, or near, consumers’ premises. This presents a new set of challenges to the grid. How much energy is being produced? When? Where? Which way is the power flowing? Voltage Collapse – An event that occurs when an electric system does not have adequate reactive support to maintain voltage stability. Voltage collapse may result in an outage of system elements and may include interruption in service to customers. 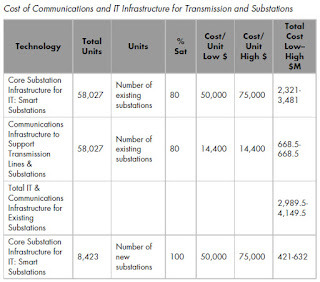 Congestion – The Smart Grid can reduce transmission congestion costs from increased transmission transfer capability without building additional transmission capacity. Thermal constraints - Limit the capability of a transmission line or transformer to carry power because the resistance created by the movement of electrons causes heat to be produced. Overheating can lead to two possible problems: The transmission line loses strength, which can reduce the expected life of the line, and the transmission line expands and sags between the supporting towers. This presents safety issues as the lines approach the ground, as well as reliability concerns. If a transmission line comes in contact with the ground, trees, or other objects, the transmission line will trip off-line and not be able to carry power. Voltage Constraints - Voltage can be likened to the pressure inside the transmission system. Constraints on the maximum voltage levels are set by the design of the transmission line. If voltage levels exceed the maximum, short-circuits, radio interference, and noise may occur. Low voltages are also a problem and can cause customers’ equipment to malfunction and can damage motors. System Operating Constraints - Refer to reliability and security. Maintaining synchronization among generators on the system and preventing the collapse of voltages are major aspects of the role for transmission operators. North American Electric Reliability Council guidelines require utilities to be able to handle any single outage through redundancy in the system. When practical, NERC recommends the ability to handle multiple outages within a system. Electricity Transmission A Primer By Matthew H. Brown, National Conference of State Legislatures Richard P. Sedano, The Regulatory Assistance Project .This primer on electric transmission is intended to help policymakers understand the physics of the transmission system, the economics of transmission, and the policies that government can and does use to influence and govern the transmission system.